Pelo Camp is a new seasonal camp on the Jao Concession offering classic water-based activities in the permanently flooded portion of the Okavango. Pelo means "heart," a fitting name, as the island on which the camp sits is heart-shaped – discernible when flying in. Located as deep in the watery heart of the delta as you can get, Pelo Camp is designed to offer a genuine wilderness experience with a light footprint. Guests will boat into camp from the Jao airstrip, and once in camp, the prime activity will be excursions by mokoro, the traditional wooden dugout canoe used in the delta. Though the camp's location is fixed, it utilizes no permanent structures other than flushing toilets with a septic system. The camp is comprised entirely of tents that house private guest accommodations, a main lounge and dining area, kitchen, laundry and small staff village. Individual guest tents have private covered verandas and en suite bathrooms with flush toilets and running water in the basins. Each tent has a private outdoor shower located just a few steps outside your tent that is filled with hot water on request throughout the day. 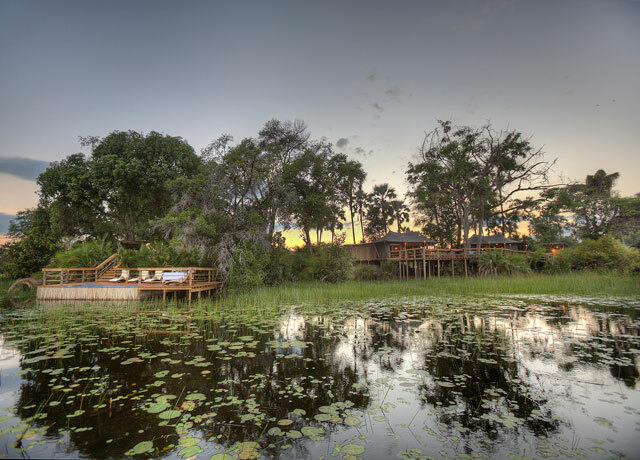 Pelo Camp enjoys a lovely shaded location between wild date palms, jackalberry and Natal mahogany trees. An outdoor boma area and a raised platform expand the public space.